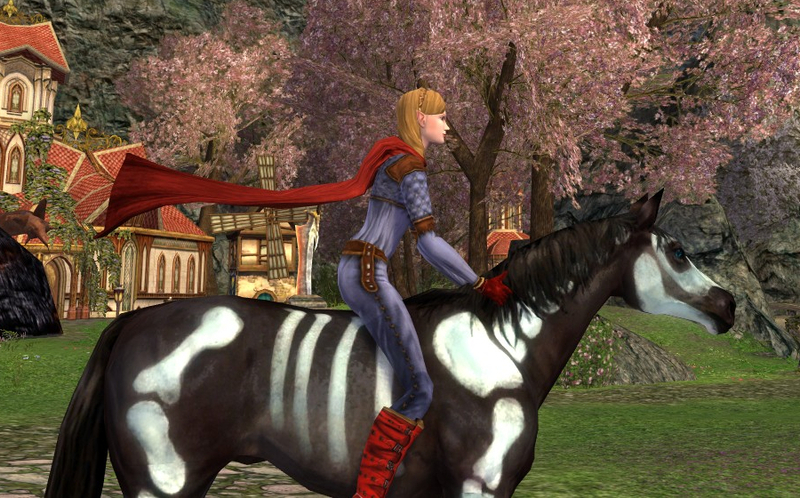 Supergirl and Red Painted Skeleton Horse prepare to fly to Draigoch. 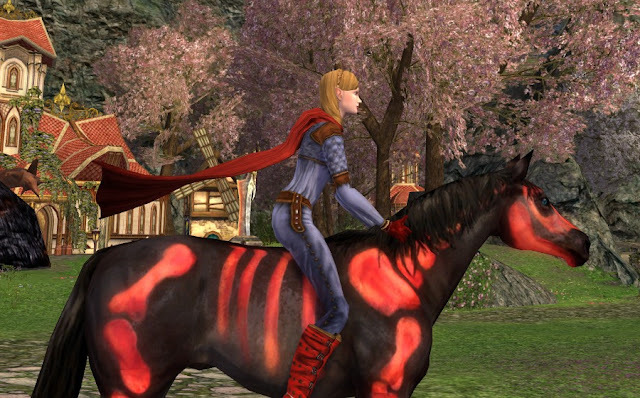 "You have acquired the Red Painted Skeleton Horse skill." 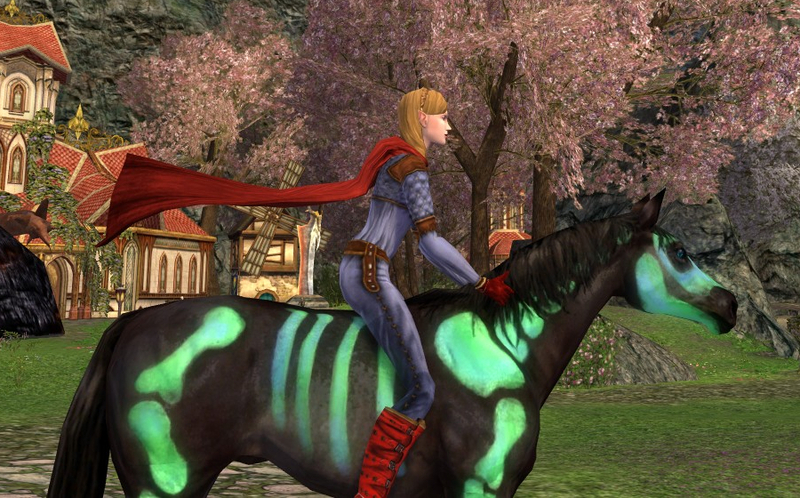 If you follow this blog, you will know that I have been seeking the Red Painted Skeleton Horse for a long time. 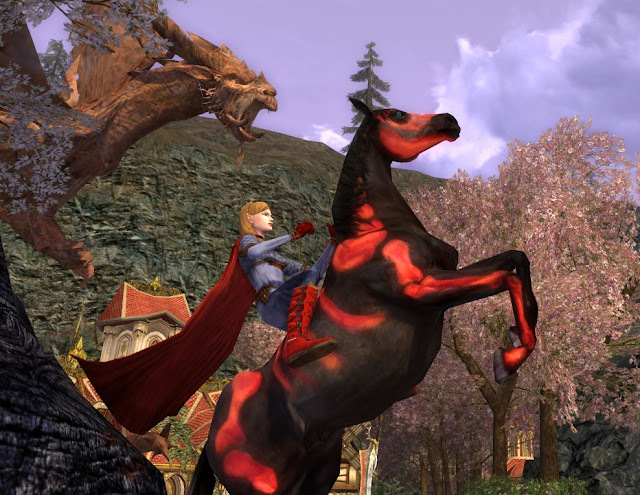 The ability to buy it from the lotro store was one of my Top 11 things I would change when I rule Middle Earth... top-11-things-i-would-change-when-i-rule-Middle-Earth! The Search: And, finally on the 87th lootbox I opened searching for it, it happened. The Red Painted Skeleton Horse had come to me! No, I didn't open all the 87 lootboxes at once. I periodically buy a few here and there from the AH over the past year, hoping for this horse. 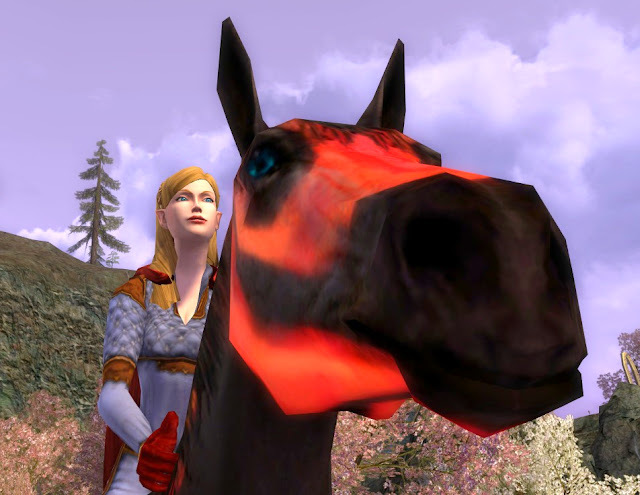 Yes, it was easy to remember how many lootboxes because this horse was the only reason I was acquiring lootboxes. :) Patience. Determination. Perseverance. I got the Red Painted Skeleton Horse on June 24, 2013. The lootbox text says that this horse has a chance to drop from any of the lootboxes. Mine came from a level 50 lootbox. I *WAS* wearing my Erebrandir's Horseshoe, which now contradicts what I said last week about not getting anything good while wearing it. It may have absolutely no bearing, but now I am even more superstitious about wearing it. (u11-hobbit-presents-30-day-review). I tended to buy level 50 lootboxes lately because when they didn't give me a horse, they might give something useful to my team of lildanas who are all around level 50, plus the AH price for them tends to be ≈ 4g versus the Riddermark lootboxes that were listed ≈ 40g. (lildanas @ crafting-to-mordor-part-2). 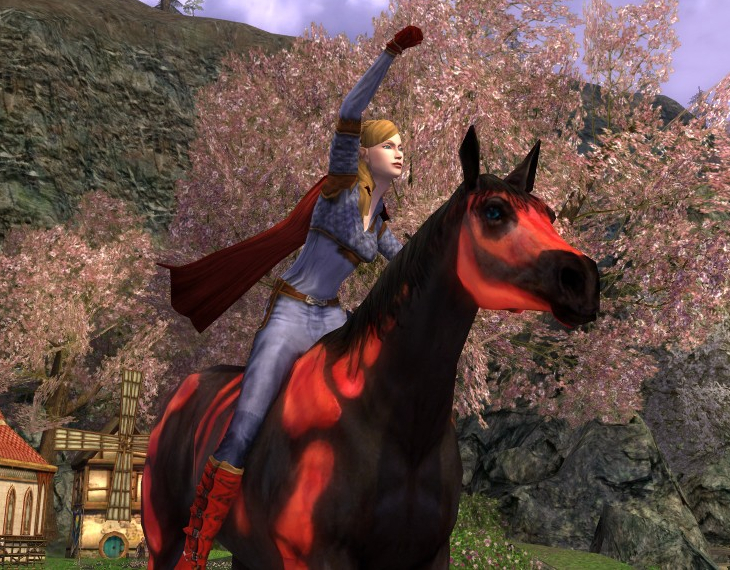 I cheer at finally bringing home the Red Painted Skeleton Horse. Redemption of the Lost: After acquiring 100 other steeds, the search for this one became something of the "Parable of the Lost Sheep" (wiki: Parable_of_the_Lost_Sheep) where "a shepherd leaves his flock of 99 sheep in order to find the one sheep who is lost." Comparison to other Skeleton Horses: The Red Painted Skeleton Horse is identical in look to its siblings, the Skeleton Painted Horse (white) and the Green Painted Skeleton Horse. The White one is a very rare drop from the Haunted Barrow during Fall festival. The Green one was sold in the lotro store only. The Green one and the Red one are both +68% speed and the White one is +62% speed. Painted Skeleton Horse - a good complement to the Red and Green. Green Painted Skeleton Horse - a good complement to the Red and White. Red Painted Skeleton Horse - a good complement to the White and Green. Aye, congratulations are in order! And it matches your outfit even better! Congrats at last. I had felt a little guilty riding mine around when I knew that you had tried so long and never gotten it. Thanks Gloredh, ClearTrampoline, Tomeoric,and Anonymous! Lol! It wasn't too hard getting the horse to smile; he seems to like it in Falathlorn (a lil peanut butter helps also). Haha, the color does match better. His eyes even match mine. Well done, Danania! Now you look very coordinated with your outfit. I hope I can get a red one some day. Determination is a virtue, right?